Tornado shelters have been our specialty since 1970. Let us help you keep safe during the storm. Every storm shelter is made out of steel and is made to withstand years of use, unlike concrete which will crack and leak over time. All of our storm shelter units have special formulas of paint and special waterproof/resistant coatings applied. We have wheel chair accessible safe room and hillside units available. We have financing options available upon request. We deliver anywhere in the Continental US and our general install time is about 2.5 hours once on site. Refer a friend and recieve $50 for every friend that buys for a lifetime (Even if you sale your home or move away). The idyllic setting of Russellville, AR, has gotten used in many TV productions, films, and as other backdrops. And living here allows you the comfort of live music, community events, outdoor recreation, and more. However, no place to live is free from natural disasters and hazards, and more homeowners discover the hard way that it pays to remain prepared. And while you have many options for a storm shelter for your property, only one name stays the trusted choice time and again. Since 1970, more families and residents have turned to us at American Storm Shelters for all of their manufactured unit needs. They know that no storm can penetrate our highest quality of shelters, nor will they find a more cost-effective approach to their family’s safety. When you need lasting confidence that your loved ones always have somewhere to go during an emergency, we offer the best way to shield yourself from storms. Don’t get caught off guard by unexpected twisters again with our lasting defensive units. Traditional basement spaces and included shelter areas often prove ineffective. While they may prevent harm from falling to your family, they don’t hold up to the roaring winds of a tornado. Instead, you can enjoy prefabricated shelter units manufactured from 11-gauge steel panels. These durable units get set into concrete, where nothing will remain strong enough to damage them. And more tornado shelter solutions. No matter what building you remain in or how many others are with you, we guarantee the best protection around every day. Make sure that your house stays prepared for any severe storm with our highest quality of manufactured shelter units. How Many Tornadoes Does Russellville Receive? The problem in creating home storm defense is that too many homeowners wait until they know a disaster is possible. Unfortunately, by then, it’s often too late, and now their loved ones find themselves in harm’s way. Some years may only see one minor tornado, while others could form dozens. You never know what the forecast has planned next, and it’s best to keep yourself ready for the worst. You could go months without fearing a single severe storm, or you could see one blow through the state after another. No matter how active storms remain, however, you’ll be glad that you have somewhere safe to wait for it to end. When you can’t afford to gamble with your loved ones’ safety, you need our best-manufactured storm shelters today. Prevent future emergencies on your property with a defended storm unit today by American Storm Shelters. Fill out this form or call 800-687-4007 for immediate service. We take calls 7 days per week. Will you help us find the the right p[lace for our shelter? Absolutely! We want you to be 100% happy for years to come with your purchase. Will I get struck by lightening inside these units? No. The units are grounded and since these are built to FEMA standards you won’t have to worry about your safety will taking shelter inside our units. Why is steel better than concrete? Steel units have a longer life span. Concrete has a seam and tends to leak after the top is attached to the bottom. The sealant in a concrete unit will dry rot, letting water seep in through the gap. They are also very pourus causing a musty smell and they will crack when the earth shifts creating major problems. Does someone need to be present during installation? Thats completely up to you. After we’ve agreed on the appropriate location for your storm shelter, you’re welcom to leave and come back to sign the contract after you are 100% satisfied. We don’t ask for money up front so you don’t pay until the job is complete and you are happy. Why don't you sell in the garage floor units? The only ventilation in those units in the slots in the sliding door that tends to get bent causing people to get stuck in these units. If a pipe burst while you are in this unit you have no other ventilation source. What goes up in a storm must come down and people have gotten trapped and died. Our philosophy is that if it’s not safe for me, then it’s not safe for you! We strive for customer satisfaction. 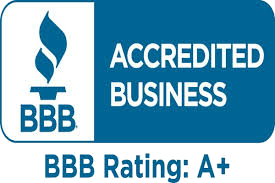 With our A+ BBB rating and countless good reviews on our units there’s not a reason to shop anywhere else! Our storm shelters are built right! With superior steel construction and included warranty you’ll feel safe for years to come. Call or email us at any time with any questions you might have. We will do our best to serve you and answer all your questions.